A source close to Bolingbrook Mayor Roger Claar says that the mayor is planning to incorporate his own bank in order to protect his campaign fund. According to Steve, Claar hopes to have bank up and running before President Bush steps down. He will use his campaign fund to pay for the bank, and then ask for federal bailout money. "He said, 'Steve, I have to think about my family's future and Bolingbrook's future.'" Said Steve. ""I give out thousands of dollars from my fund to help out average citizens. That spurs development in Bolingbrook. I'm already a bank! I should just make it official.'" According to the March 18, 2007 Harold News, in 2006 Claar spent $20,000 on a New Years reception, $20,000 for college scholarships, $1000 for a funeral, $3,578 for high school baseball dugouts, and $32.39 so a "citizen" could buy jumper cables. According to Steve, Claar says donations to his campaign fund have dropped due to the economy. By incorporating his campaign fund into a bank, he feels that he can get federal bailout money, and continue to provide "community development" grants. "He kept telling me, 'Steve, don't think of this as a bailout. Think of this as paying for democracy preservation. Will County Republicans are counting on my funds. Without me, the Cook County Democrats will overrun Will County in a matter of days. I need to get those funds in one week, or the suburbs will fall to a Cook County dictatorship!'" Steve also said that because the Treasury won't buy Claar's "debt" through an auction, he could use the funds to pay himself a bonus, and live off that money for the rest of his life. "But he'll save taxpayer's money by no longer taking a salary from the village." Added Steve. Steve also says that Claar is concerned that President-elect Obama won't give him the money. "He said that Obama is so full of vision that he can't see the importance of help a man of Roger's stature." Said Steve. "Roger wants this done before January 20th, but I think Obama could still help him. 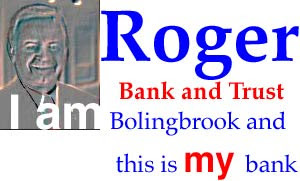 All Roger has to do is threaten to publicly reveal his bank unless Obama gives him money. The media will tear Obama up over this, even though he had nothing to do with Roger's plan. That's how Washington works now." When asked to comment, Claar replied, "That idea sounds so crazy that it might almost work. I knew there was a reason I never shut you guys down." The Will County Democratic party released this statement: "We do not like this bailout, but we guess we have no choice but to bailout Roger's bank." Chicago churches to Packers: Lose and we'll save your souls!